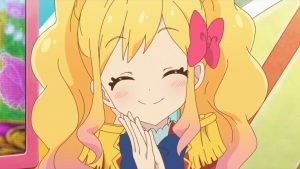 I have decided to just write a simple guide on various aspects on Photokatsu (Aikatsu! Photo on Stage!!)（アイカツ！フォトオンステージ！！）. This is the only mobile game I am playing on my phone. Disclaimer: I am by no means a skilled player. I still have quite a few songs that I didn’t manage to perfect combo. 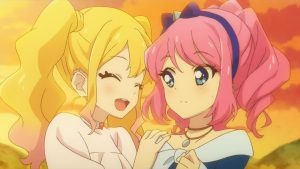 November 2017 Updates: Fixed some of the mistakes in the page and also introduced some of the new feature updates in Photokatsu this year such as Charm System, Same Series Score Bonus, High Score Award event. Click to open the enlarged menu translation in a new window/tab. This game is just a basic rhythm game for Aikatsu songs which you tap on notes that appear on square panels. Some songs may not have their legendary difficulty available yet. You unlock each song and difficulty by playing the character Scenarios（シナリオ）. Try to start at least chapter 1 and 1.5 of all characters’ scenario if you still have songs left to unlock. You get a miss/good/very good/perfect depending on the timing which you tap on the notes, but all except miss will continue a combo. Stamina is used to play songs. 1 Stamina is regenerated every 5 minute so you will get 12 Stamina per hour. During level ups, the stamina also be refilled by the amount of max stamina. You may notice a dash button just on the right corner of the play button. Extra stamina can spent when playing a song to obtain extra rewards and reduce the times needed to spend you stamina. Highly useful when you do not have time to play for a long period. I am not a very good and accurate player myself so I usually aim to continue a combo rather aiming for more perfect hits. Better players can disregard this. For adjacent red notes, I am usually bad at using multiple fingers on the same hand to tap on it at the same time, thus usually results in a miss when I try to do that. You can try using a finger swipe across the red notes instead although this will not give you a perfect tap at least half of the time. Of course this is the part which we collect our favourite idols. Of course everyone want to have more PR photos. There are also four types of Songs and Photos. There are a few ways which we can obtain these cards. Heart Points Gacha that require 1000 Heart Points for 1 roll and 10000 Heart Points for 11 rolls. This usually only gives N photos and some low ranked Johnny Sensei photos. You also get 1 free roll per day but you can get nothing much from this. I usually ignore this simply because I am just lazy. BUT it is proven to have a very very small chance to get PR out of this. It is also a good way to get more trade points if you have too many heart points to spare. Special Gacha that require 25 Stars for 1 roll and 250 Stars for 11 rolls (1 Guaranteed SR and above). This is the one that we usually despair when trying our luck with but yeah you will be playing with this often. The probability which you obtain different card and ranks changes from time to time but it is usually 2% for PRs and 20% for SRs. There are times which the PR probability getting increased to 4% or some photos getting increased probability to drop with respect to other photos. You can check the probability of each photos just below. Event Special Gacha that require 25 Stars for 1 roll and 250 Stars for 11 rolls (1 Guaranteed SR and above). This is another important one that works similar as above. Though this has a limited pool of photos which may or may not be desirable if you are aiming for photos for certain idols. Event cards also provide some bonus to the current event performance so you might to try some for the boost. There are also other Special Gachas that appear from time to time that gives out different photos so keep an eye on it frequently. SR and R photos will be given out if you obtain enough event points or obtain a high enough ranking. Recently they are also giving out PR photos as the ultimate event point reward for medley event but I am not sure if this will continue on. There are also drop event where you get SR and R photos randomly just by playing normal songs. It is a good way to get PRs of characters that you really want but have no luck in rolling them gachas. To make good use of your photos, they should be leveled up to the max and dressed up. After getting dressed up, they should be leveled up to the max again. There are a few rare photos that come pre-dressed up. I would recommend all photos to be leveled up and dressed up, as you will be able to get stars from the Photo Binder（フォトバインダ） after you have done that. Leveling up photos will require Johnny Sensei’s Photos. Using Johnny Sensei’s Photos of the same type as the Photo gives 1.5x exp. From Monday to Friday, each day there are 2-3 hours of Johnny Time（ジョニータイム）. Playing songs during this time will drop the corresponding type of Johnny Sensei as the type of the song played. However playing during Johnny Time on Friday will give you Johnny Sensei of random type. For Saturday and Sunday, all drops will be Johnny Sensei so just play the song of corresponding type that you want to collect. Dressing up photos will require Dress Up Tickets and Proof of Evolution. Dress Up Tickets and Proof of Evolution have different ranks and Proof of Evolution also have different types which are used to dress up different type Photos. Dress Up Tickets will drop randomly from Monday to Thursday. Playing higher difficulty songs will have a higher chance of obtaining higher ranked Dress Up Tickets. Except during Johnny Time, Proof of Evolution of the corresponding type will also drop on different days. Playing higher difficulty songs will have a higher chance of obtaining higher ranked Proof of Evolution. Firstly all photo has two parameters, Aura（オーラ）and Appeal Points（アピールポイント）. The photos are also having different skill（スキル） effects when special appeals is being used. Aura will directly affect the score being obtained when you continue tapping on the panels. Appeal Points will be used the calculate the score obtained when Special Appeal is being used. If the photo used is of the same type as the song, the aura/appeal point will be multiplied by 1.3. For example, using a Aoi (Cool type) on Prism Spiral (Cool type). Firstly, tapping the panels will increase the appeal gauge on the left. Perfect taps will increase the appeal gauge much more than others. Whenever the appeal gauge gets full, a special appeal will be used. There can be a maximum of 4 special appeals per song, but to reach 4th special appeal, it is required to have an almost all perfect taps. If you have PR photos, they should be in the first three slot for extra powerful special appeals regardless of type (Especially Stars photos). Preferably they should be of the same type as the song. The remaining photos should be of the same type as the songs. The above are just a general guideline to maximize score gain. Exception applies and you may still want to use certain photos irregardless of score efficiency. Certain photo combinations also affect the smiles that boost partner points so if you are interested in fanclub rankings, you may want to take consideration of that. For example, I have my Cute PR Ichigo in all my units because I just want to increase her Partner Points for fanclub ranking. Also, during events, Pickup photos may be desirable to improve event performance. During events, usually there are special login bonus, and you can gain some stars and other stuff. There are also usually Event Gachas. Usually there are just three type of events. Just play normal songs to gain some tokens. And the tokens can be used to play event songs. Event songs will award event points. Playing the songs on a higher difficulty will reward higher tokens and higher event points. Score rank matters but actual score does not matter for tokens and event points. As long as you get S rank, no matter how high is the score, the result is the same. It is possible to dash during token collection and during event songs. The tokens and event points will be multiplied accordingly. Point rewards will be obtained once you reached certain event points. Event points will also determine your event ranking which can give you Ranking rewards after the event ends. Event SR and R photos can be obtained from Point rewards and Ranking rewards. Event SR and R photos can be dropped during drop events. There is an option Full Power dash to use up your stamina to multiply the event points. Playing the songs on a higher difficulty will reward higher event points. Actual score matters during the medley. It will affect how much event points you get. For example, 1000000 score will get more event points than 900000 score. There has been a new type of event starting recently in October 2017. According to October and November event, it happens on random times on the time. Just keep a lookout if this event happens. Just score as high as you can in the predetermined song in this event. The beatmap of the predetermined song is randomly rotated, flipped up, flipped down from the original beatmap. The rotated beatmap can get very difficult, but you can actually cheat by rotating your phone/tablet. There is another higher rank: Excellent above Perfect for the taps which you can get only if you are even more accurate. There are also event scenarios to be read during Token Event and Medley Event, be sure to go through all the event scenarios as they provide you a small amount of stars at no extra cost. During events, there is a type of photo known as Pickup photo. They can be obtained from event gachas or from previous event rewards. They provide a bonus during events, and thus will help you for progress during the events. A maximum of 3 pickup photos will take effect in one unit. The effect will last until end of month and will be reset into normal photos. This is just optional. You get to join the first fanclub of your favourite idol for free and others for 1000000 Heart Points. To increase your fanclub rank, just play the songs with your idol in it, and they will earn PP (Partner Point) for the fanclub to rank up. Smile（スマイル）will also affect PP earned. Due to a recent update, this is no longer just a cosmetic thing. NEW: The release of the Charm （チャーム）system allows charm points earned to be used in some kind of skill tree known as Charm Road. It allows unlocking of some voices, extra aura/appeal points to the whole team whenever the idol is being used in a unit, and some extra unique skills. Charm points will increase at the same rate as PP earned and also by feeding the idols Anna Sensei photos. Everyone start with 100 slots and eventually most of us will outgrow that. You can buy 5 extra slots using 5 stars each time in the Shop（ショップ）. You can link your account to Twitter or Line so that you can recover your account in case you lost your phone, accidentally uninstalled or break the application etc. I tried to cover as many basic things I can think of. I do hope to improve this with some images though. Feel free to ask me any questions. Happy playing!!! !